For the many people who sent me messages this week like "I read the blog on the Supreme Court and I can't understand how 9 non-elected, appointed judges have managed to gain so much power that their word is law. I don't believe that our Founding Fathers had intended to put so much power in their hands. Is there any way that the Legislative Branch can overrule them the same as they can overrule the President if they choose to?" Of course there is a way - the Constitution makes it very clear that the Legislative Branch – the one closest to the citizenry has the final say – not nine unelected judges. What we saw this week in the Supreme Court hearings on ObamaCare, & will soon find out to what extent it affects all of us, is the result of apathy of the people never intended by our Founders. When the citizenry lost interest the politicians including Supreme Court Justices took control over whatever turf they could & we work within such a system today. I sum up this week's historic happenings by quoting from President Lincoln's first inaugural address the very theme I made all week long – "If the policy of the government, upon vital questions, affecting the whole people, is to be irrevocably fixed by decisions of the Supreme Court, the people will have ceased, to be their own rulers, having to that extent, practically resigned their government, into the hands of that eminent tribunal." Following last night's subject posting I received many telephone calls showing the Supreme Court hearings re the constitutionality of ObamaCare obviously struck some nerves. I just hope that the intensity & involvement I listened to during these calls can be maintained. Actually the intensity & involvement needs to be increased for us to have any chance @ all as indicated by the vote below where 95 Republicans voted earlier this month to expand ObamaCare to include veterinarians in the definition of public health officials. If your Congressman is on the list you don't have to wonder how he feels about the Supreme Court decision re ObamaCare. Below is an e-mail that expresses most of the sentiment that I heard – this one from the man I refer to as Our Night Watchman. Also below is a partial excerpt from today's Neal Boortz blog – Neal draws the same conclusion I did. Namely, a Supreme Court decision that finds the individual mandate unconstitutional but leaves the rest of the law in place is even more dangerous than the original law ever was. Thank you Doug & Carol for reporting on the Supreme Court ObamaCare ruling that will be forthcoming in a few months. There is something inherently wrong with a system in which nine people will decide what 330 million Americans are supposed to do like if the Supreme Court upholds this atrocity, especially in its entirety. I understand it is our system but the majority of the people as well as a majority of the states do not want this legislation imposed on us. If the ObamaCare law is upheld in any form it tells you that Government is force & nothing more. Our Constitution guarantees the principles of federalism in which the distribution of powers of both the federal government & the states are defined. America is a republic not a democracy & our republic was founded on limiting the size & scope of the federal government. As I said yesterday, I'm not as optimistic that the Obama administration "blew it" enough to overturn the individual mandate. We have four liberal Justices who won't give one ounce of consideration to the Constitution here. All it takes is one of the other five Justices to believe that congress is acting within its authority … and the game is over. What, though, if the Court does rule the individual mandate to be unconstitutional, but allows the rest of the law to stand? I don't believe Democrats will be all that upset with this outcome. If the rest of the bill is allowed to stand there are plenty of weapons the Democrats and Kathleen Sibelius can use to run the private insurance companies out of business. That, after all, is and has been a primary goal of the left. Once the health insurance companies are destroyed it will be time for their coveted "single payer." That single payer is, of course, the government out on top. The individual mandate seems to be in trouble. When some favored Obama initiative is in trouble you don't withdraw it or modify it … you rebrand it. You go to the focus groups and test some new wording to see what will work with the dumb masses. The focus groups have made it clear that they can't really cuddle up to the world "mandate." Another word is needed. So now, at least according to ObamaLand, the "individual mandate" has become the "personal responsibility clause." Here's a quote from an Obama propagandist: "The administration remains confident that the Affordable Care Act is constitutional; one of the reasons for that is that the original personal responsibility clause…was a conservative idea." Now I have to admit .. this is brilliant. If .. and it's a big "IF" .. the Court invalidates the mandate our Dear Ruler can tell the world that the Supreme Court has ruled against the "personal responsibility clause" of ObamaCare. And … well … since personal responsibility has not been ruled unconstitutional, the government is simply going to have to step in! Now that the three days of oral arguments before the Supreme Court re whether or not ObamaCare is constitutional are over all we can do is wait for the decision that will determine which path the country proceeds on. Carol & I made time to listen to the audios of the arguments broadcast on C-SPAN about 1 PM on all three days – this way we didn't need talking heads later to tell us what happened because we knew first hand. The first day was bland enough with the Justices pretty much telegraphing that they were not going to go for the provisions of the Anti-Injunction Act of 1867 that requires taxpayers to actually pay their assessments before they can challenge a tax's legality. Since tax payments for ObamaCare do not begin for two years this proposal by BO's lawyers would have delayed the Supreme Court's decision to well after the November election & to their credit the Justices would have none of it, or so it seemed. The second day concentrated on whether or not the ObamaCare individual mandate requirement for people to buy healthcare insurance or pay a penalty is constitutional & the third day concentrated on whether or not the entire law should be scrapped if the individual mandate is found unconstitutional. There were also arguments re the expansion of Medicaid under ObamaCare. Now the biggest problem comes with a mix of the Supreme Court finding the individual mandate unconstitutional but leaving the rest of the 2,700 page ObamaCare law in place. This would in essence produce a law that is unworkable from an insurance industry standpoint. Without the individual mandate in the law people would not need to secure insurance while they were healthy but rather could wait until they were sick enough to need it under the "guaranteed issue" clauses of the law. The "community rating" clauses of the law would ensure such sick people would pay no more than perfectly healthy people who chose to buy insurance for their own reasons while they were healthy. You can see that insurance companies would quickly go out of business setting up & really accelerating exactly what BO has wanted all along – single payer universal healthcare. America could be on this accelerated path to socialism this summer if the majority of the nine Supreme Court Justices rule (vote) as indicated above. Nine people who the great majority of Americans could not name or identify if their lives depended on it – which in this case it just might. Thanks to everyone who responded to the subject message that highlighted the ObamaCare case that is currently being heard by the Supreme Court - "I pray the people arguing this case are capable to rebut every sparring word the opponents make. Am sure they can do better than me. God help them." This from a long time reader of the blog. Below is a very thoughtful response received from an unknown (to me) subscriber to ReturnToExcellence.net. The writer is asking for some answers that I provide in red. In summary - the country was founded on having an informed citizenry who originally only voted in people who followed their oaths to support the Constitution. If that was the situation today we not only would not have this Supreme Court case we would not have ObamaCare itself. I don't entirely understand where you are going with this piece. Would you be upset if the Supreme Court were to decide that the individual mandate of the AHCA exceeds the scope of the Commerce Clause (Article I, Section 8, Clause 3)? Or is your concern outcome determinative? The power of the Supreme Court works both ways. - We have painted ourselves into a corner where the Supreme Court is the best chance we have to declare ObamaCare unconstitutional. This line of thinking (i.e., mindset) is a double edged sword – the next time something like this comes up the Supreme Court (nine unelected but appointed for life judges) may very likely vote against your preference & in fact may do so re ObamaCare. We should be looking to return to the principles of our founding – not looking for temporary gains in a system destined for destruction. Changing the mindset to return the courts to their intended constitutional place in our Republic provides an excellent, but just one, example of the citizenry not accepting business as usual in a country where everything is stacked against us just waiting to see how much we can lose. We must recognize the current onslaught by statists to invoke a socialistic system on us. If there were no Supreme Court to make the call, there would be nothing to potentially put the brakes on the Executive and the Legislative branches, who have already made their call. Should Obama be re-elected, Congress will be unable to repeal the AHCA, and the cement that is abridging this aspect of individual liberty will solidify. – Yes, the Executive & Legislative branches have made their call & following the principles of our founding that call (ObamaCare) should stand until overturned by future Executive & Legislative branches with no interference from the Supreme Court. The decision in Marbury v. Madison (1803) established the Supreme Court's self-declared claim to judicial review (i.e., the ability & duty to determine whether or not the actions of the other two branches were constitutional) that entrenches the Supreme Court to this day as the lead branch of government. Judicial review by the Supreme Court is itself unconstitutional & is allowed only by the weakness of the other two branches – e.g., the Supreme Court alone will determine whether or not ObamaCare is constitutional. Ever ask yourself if this is right? Did the Founders envision something like nine unelected judges overruling 537 elected officials? Elections have consequences & ObamaCare is just one of the consequences of the last presidential election. It was unclear, when the the Constitution was first ratified, whether the Supreme Court could rule on the constitutionality of a statute. But the Supreme Court has been exercising that power since Marshall. The Supreme Court seized this power early on in our Republic & it has haunted us ever since. The Judicial Branch was originally intended to be the weakest of the so-called three equal branches. As you aptly pointed out in your letter to the Wall Street Journal, the President also has a remedy. The President can exercise his or her own veto power when the legislation comes to the Presidential Desk, and he or she has constitutional concerns. From our founding to the time of the Civil War presidents routinely vetoed bills because they thought them unconstitutional – mostly for spending issues. All of my comments above illustrate the return to excellence of libertarian principles that America was founded upon & originally followed that my writings are named for & are all about. Last November we had a series of messages that revolved around the The Needed Activist Judge Mindset Change message that included my published letter to the WSJ & highlighted the fact that the Supreme Court is supreme only over the Judicial Branch. The other two branches are their equal and if anything the elected branches are higher in times of tension between the branches. Eliminating the false supremacy of the Judicial Branch over the other two elected branches is just another mindset change that needs to be made in our country although in this instance the best chance we have of slowing down ObamaCare is with this Supreme Court case. Win some lose most. This is especially important to understand as three days of oral arguments before the Supreme Court begin on Monday re whether or not ObamaCare is constitutional. This case, seemingly about healthcare, is really not about healthcare or healthcare insurance @ all & it is not the Supreme Court who should decide whether it is constitutional to begin with based on our Founders' intentions. If you start by putting yourself in the Founders' mindset you quickly realize that the Constitution & the Bill of Rights were both written explicitly to keep the government off the peoples' backs. There is no massaging or spinning the language in these documents that change the founding principles of our country - limited government, personal responsibility, & free enterprise. None of the arguments for ObamaCare pay any respect @ all to these principles. After this Supreme Court case is decided it will be magnified, whether the issue is healthcare or most likely something else, that all of the future High Court decisions are really focused on the direction of the country toward liberty or socialism rather than the specifics of the particular case. The subject message brought several responses of amazement like "Doug, thank YOU for informing us of these executive orders. I didn't know about them at all...even missed Sean Hannity's presentation." Sean presented it as a minor "C" news story – although he acted concerned during the presentation. It shows that the internet & blogs are the best way to get information to people – this is why it is all the more important that our information is correct. Please don't just forward sensational stories that turn out not to be true – it only hurts our cause & credibility. Wouldn't you think the exec order story should have gotten better coverage (really non-existent coverage) than it did on the conventional news media? Does this tell you something? Another response – "All the more reason to get rid of Obama. So, no more bad mouthing Romney...our very way of life is at risk." The thought that the continuance of our way of life depends on Mitt Romney, a politician who has been on every side of every issue for the past eighteen years, is just about as depressing to me as the thought of BO being re-elected. US Dollar collapse and opportunity this can present to transition U.S. into Marxism. Why? BO is intelligent, understands economics well. He may very well realize that increasing debt well over ratio to GDP may soon (1-2 Years maybe less) will result in foreign creditors declining to finance our debt, thus a $ collapse, rampant inflation, start of a economic downturn much more severe than 2008. BO may have assessed that he will be able to blame capitalism. Then by implementing the executive order he may take over many industries and ration many resources such as food, housing, energy, health care. Karl Marx and Saul Alinsky, BO's ideological idols both stressed timing in initiating revolutions. Both stressed need to not overextend themselves which could result in repudiation for revolutionary change. BO may be in a grey area. He may be encouraged due to reliable intrade.com betting 60% he will win re-election, poor Republican primary participation and weak field, compliant media, OWS success now back in Zuccotti Park, and U.S. mindset capitulating to total dependence on government. Perhaps BO is waiting for the dollar to collapse then go full force with peacetime martial law. Then he may be confronted with the major wild card: terms of our foreign creditors. I have read material from economists claiming to understand foreign creditors, the G20 and the IMF. Their conclusion is that they will not allow a total socialist or Marxist solution, understanding that historically such solutions have never resulted in a strong economy. Instead they will set up stronger global monetary system but allow all nations with much private economic opportunities and market competition. However there are global economic powers such as George Soros who believe in global socialism. We can not be sure which side would win. Maybe BO has researched this quite well: maybe he is however overextended and will be severely disappointed (ex IMF says get lost BO). What to do now? We still may have some time for optimism. Do your part to inform as many people as you can in an unemotional way what choices lie ahead. Blog on news sites and Facebook. And email as many members of the House of Representatives as you can asking for BO's impeachment for this unconstitutional executive order. Ever since BO signed the executive order, entitled National Defense Resources Preparedness Order on Friday March 16 granting himself absolute control & authority over all the country's natural resources (domestic energy, production, transportation, food, and water supplies as examples) in case of a natural disaster or during a time of war I have been barraged with messages from my readership – thanks to every one of you for your deep concern that is totally justified. I have tried to hold everyone contacting me on this @ bay asking you to wait & see if the hostile anti-American news media would report the story & of course they did not. The best I could find was Sean Hannity presenting it as a "C" news story on Monday night – three days after the fact. This would have been the "A" news story Judge Napolitano would have presented on "Freedom Watch" & of course this type of reporting (& his support of Ron Paul for president) is very much why he was abruptly taken off the air by Fox Business Network a few weeks ago. Please note I said Fox, the ratings giant not your savior. In a nutshell, the above executive order is the blueprint for Peacetime Martial Law and it gives the president the power to take just about anything deemed necessary for "National Defense", whatever he decides that is. It's peacetime, because as the title of the order says, it's for "Preparedness." Specific sections of the order make it clear that the president may take complete command and control of the country's natural resources in peacetime. This executive order is a follow up to The National Defense Authorization Act for Fiscal Year 2012 signed by BO on December 31, 2011 that allows the president to indefinitely detain people the government suspects of involvement in terrorism including U.S. citizens arrested on American soil. This period could cover decades if not the rest of your life. Naturally none of the above rip-offs of liberty is by accident – in fact it is by BO's design as he gets more emboldened every day as the electoral opposition weakens – just look @ the low Republican primary voter turnout again tonight in Illinois. BO already has many other things in place for our undoing. For instance there is the Independent Payment Advisory Board, an unelected & unaccountable 15 member group created by ObamaCare that will determine specified savings in Medicare starting in 2014 & 2015 – i.e., denied care for seniors. All of these measures will rob you of your liberty – the bedrock of America & our prosperity. BO is ready to complete the mindset capitulation to total dependency if we are not there already. A neighbor told me today that he is worried about his grandchildren – our problems are a lot closer than that. Thanks to everyone who expressed encouragement before the airing of the subject program – such things always help. I am just as grateful for the wonderful responses received – like the ones below after the program aired. I also talked to neighbors who seriously asked me how many people were on the panel doing the questioning – it did seem like a lot didn't it? The comments below are quite complimentary but please realize that I present them only for encouragement for all of us to do what we can for America because she needs help more & more every day. 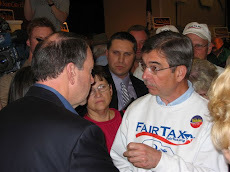 Doug - I want to take this opportunity to congratulate you on an outstanding job promoting the virtues of The FairTax. I particularly enjoyed the segment between you & Chuck H. He started off negative but you immediately identified the benefits of The FairTax leaving him an advocate at the end. 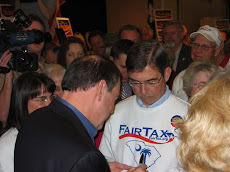 Hi Doug - Thank you for sharing the link so that I could listen to your FairTax Radio Program. I think you presented the material extremely well and I agree with Mr. Haytian the time went very quickly because the presentation/discussion was so interesting. Hopefully, you will be called back to do another program soon. Best regards to Carol. P.S. I thought Barbara's points were very good, too. I was listening to the program again myself afterward, and agree that it was one of the best yet -- you're quite the good debater on the subject -- well informed and able to make your points effectively. Thanks Doug....although the interviewing panel played "devil's advocate", you did a great job holding your own! Nice job! Regarding the subject radio program - for those who asked things like "Doug, will this radio program be accessible on ReturnToExcellence.net at a later time? I won't be available to listen that morning" please click on FairTax On Radio - 3/7/12. Although all three members of the interviewing panel of former NJ Assembly Speaker Chuck Haytian, Independence Township Mayor Bob Giordano, & WRNJ's News Director Joyce Estey played the role of devil's advocate to a fault throughout most of the program the heart felt sincere remarks made @ the end of the program were very gratifying. I remember the NJ gubernatorial election of 1981 where Democrat Jim Florio lost to Tom Kean by the slimmest of margins – in fact the margin was virtually the number of people who voted for Kean because they were incensed that the Meadowlands' Arena had been renamed the Brendan Byrne Arena to honor the previous Democrat governor – the Star Ledger ran a poll & story of people who said they voted for Kean after they saw the new name on the arena. This is really a silly issue to lose an election over isn't it? Click here to see a video, commentary, & comments re a Florida county's Democrat headquarters flying an American flag with BO's image in place of the stars on the flag. This has brought much outrage from people who just might not vote for BO because of it. Now such stunts do not follow the Alinsky method that BO is a master of & as such you can bet he was not the one who initiated the current flying of such a flag. I'm sure BO feels there is plenty of time for that after the November election. As the messages keep coming in (non stop) responding to the recent series re ISI I can only say that I have developed even more respect for people I have held very highly. The point to me has never been what you scored on the test but rather your love for America that made you participate & pass the test along thereby stirring up patriotism @ this time when it is sorely needed. Below are four more heartfelt responses that do just that. The responses to the recent ISI test I presented keep coming in & everyone of our scores is higher than the average of the college professors who took the test. That is a message in & of itself. Thanks to everyone who shared your honest understanding of the principles of our Republic. The test drew so much interest that many people asked who or what is the Intercollegiate Studies Institute. I was introduced to ISI by Professor Williams several years ago & have worked with ISI closely ever since. Carol & I have many friends there. In essence ISI is a specialized higher education firm that runs a program to identify students of superior talent who are friendly to the free society. These will be the leaders of tomorrow who share our values and who have the greatest potential to influence future generations regarding preserving liberty. ISI has a network of hundreds of college professors across America who provide formal one on one faculty mentoring to students while the students still concentrate on their major. For instance an English major could be put in touch with an Engineering professor who is part of the ISI network. The English major would obviously continue with their English studies but would also participate in the ISI program – upon completion of which they would score very high on tests such as the one I presented plus much more in-depth work. The ISI challenge, therefore, is to work a generation ahead, identifying our country's future leaders and nurturing in them an allegiance to the civic and economic ideals necessary to meet the challenges that America will face in the future that will maximize their leadership potential for our country. If you know of college bound students that you think would be interested in learning more about this program please let me know & I will put them in touch with ISI. It is an extremely worthwhile program administered by very high class people. In the meantime below are five more responses regarding the ISI test. I congratulate everyone who tried. "69% Ouch! Take care and keep up your good work!" "Hi Doug...I got a 90.91...(3 wrong) and I should have known better on one of them ....anyway, I'm glad my brain is still somewhat working!" "I got an 84.85% (28 of 33). Not so good I'm afraid...."
"Doug, 26/33 = 78.79 %." "97%. I missed the one on Susan B. Anthony." "91%" & "60.61" were the two shortest responses I received to my request from last night's subject message where I asked everyone to please let me know how you did on the ISI test. Below are five other responses – please note #5 from an anonymous reader of ReturnToExcellence.net. This is the type of comment that keeps me honest & I so greatly appreciate. I have been invited to be the guest on WRNJ radio this coming Wednesday March 7 from 10:05 to 11:00 AM. The program is entitled "Local Impact." Co-hosts are former NJ Assembly Speaker Chuck Haytian, Independence Township Mayor Bob Giordano, & of course Joyce Estey the station's News Director who invited me back to her program for the fifth time. The goal of the program is to take an issue & break it down to how it effects each of us. Although the program will focus on the FairTax I could tell from the way it was described to me that we will go over many of the points presented on ReturnToExcellence.net over time. The station's website streams live - www.wrnjradio.com. Click on "Listen Live." You may call in at (908) 852-1234. There were many responses to last night's subject message & video link like "A sad video" or "this is so sad!" Many former teachers in our group felt this way. The most insightful response was from our SC businessman who turned the question around about what poorly educated students face today to "How about what the employers will face tomorrow?"